You will earn 13,039 Reward Points. Earn 1 reward point for every 1 dollar spent. The Market Forge Gas Universe Plus Tilting Skillets are available in 30-gallon (114-liter) and 40-gallon (152-liter) pan bodies with 93,000 BTU and 126,000 BTU inputs respectively. Both models are available in open-leg and closed-base frame assemblies with manual or power tilt capabilities. The heavy duty construction of our Universe Plus Skillets incorporate sides formed of 10 gage stainless steel and a 5/8” thick stainless steel clad plate that will provide a rigid flat cooking surface with improved heat distribution. The balanced design of the pan allows the operator to easily and quickly tilt to the desired position. Our new power tilt operates smoothly, with manual override that works easily when needed and without the use of tools or drills as required by other manufactures. The Universe Plus Skillet has a fully polished stainless steel cooking surface that reduces food from adhering and helps to safely clean the equipment. Gas burners turn off automatically when the cooking pan is tilted from the horizontal position. The skillet is provided with a heavy-duty spring assisted cover and a condensate vent. The cooking pan and cover are supported by two consoles with a fully welded stainless steel tubular frame system that provides stable support to the unit. The consoles are completely covered with stainless steel that provides protection to the controls and is also easily cleanable and provides clear access for easy floor cleaning. 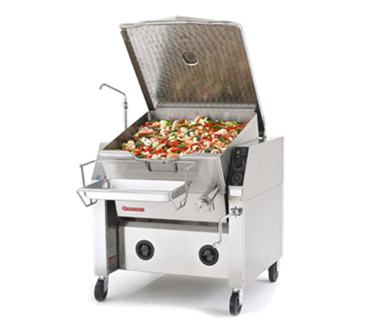 The closed-base model incorporates an easily removable stainless steel front panel. The sloped front of the pan allows for complete draining of the pan when tilted to 70°. The tilting mechanism includes a precision ground and polished worm for smooth and long lasting tilt operation and positive control with a collapsible hand crank. A power tilting option is available and is also supplied with the collapsible handle for manual override operation if required. The cooking pan with integral clad plate cooking surface is welded with full penetration to resist cracking due to expansion and contraction. The polished cooking surface resists product adherence and improves cleanup and appearance. The pan incorporates an easy-pour lip and 5-gallon increment markings. The clad plate cooking surface has electric tubular elements attached to the bottom of the pan for even and efficient heat transfer. An interlock switch is provided to turn the heaters off when the pan is tilted more than 10° from the normal horizontal position. The spring assisted cover with integral vent, condensate drip guide and full width handle affords effortless operation and will maintain an open position. The skillet comes standard with a solid-state temperature control with a positive OFF position and 100°-450° Fahrenheit scale, a pilot light to indicate when the elements are ON, and a 1 hour mechanical timer. The optional power tilting mechanism also utilizes an UP/DOWN rocker switch. The manual tilting mechanism uses a collapsible hand crank conveniently located below the control panel. The controls are resistant to dripping and light splashing water (NEMA T-2).